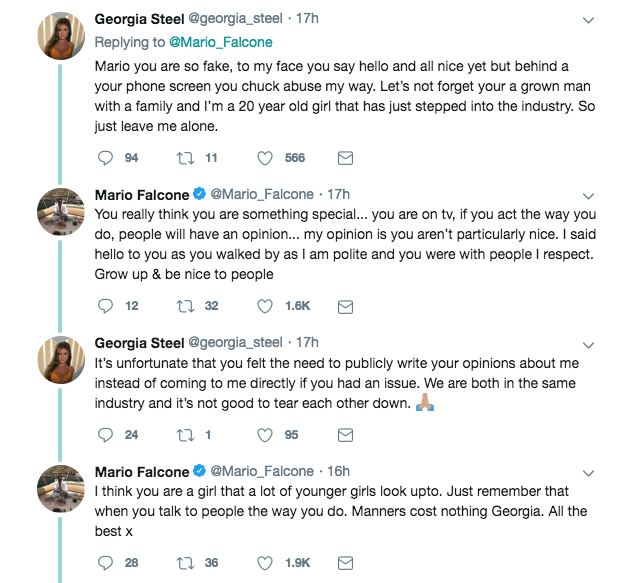 Things got seriously awkward over on Twitter last night as Georgia Steel went head-to-head with TOWIE’s Mario Falcone. It all started when Celebs Go Dating shared a clip of 20-year-old Georgia stealing a drink from a potential love match during the show’s first episode, before telling him she preferred his mate. But obviously fiery Love Island star Georgia wasn’t about to take the harsh comments lightly, and has since responded with an equally scathing Tweet. ‘Mario you are so fake, to my face you say hello and all nice yet but behind a your phone screen you chuck abuse my way,’ she started the epic rant. Mario – who welcomed son Parker Jax with fiancée Becky Miesner in November – continued to lash out, as he then Tweeted: ‘You really think you are something special… you are on tv, if you act the way you do, people will have an opinion… my opinion is you aren’t particularly nice. To which the Love Island star quickly replied: ‘It’s unfortunate that you felt the need to publicly write your opinions about me instead of coming to me directly if you had an issue. 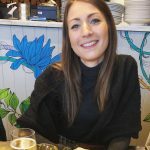 Georgia is currently taking part in sixth series of Celebs Go Dating alongside Mario’s TOWIE pal Pete Wicks as well as the likes of Kerry Katona and Megan McKenna after she split from her Love Island boyfriend Sam Bird last year.